Biggest mistake in Oscars history after La La Land wrongly named Best Picture winner. “There’s a mistake. Moonlight, you won best picture,” Jordan Horowitz, La La Land producer, announced to the gasps of a shocked crowd. 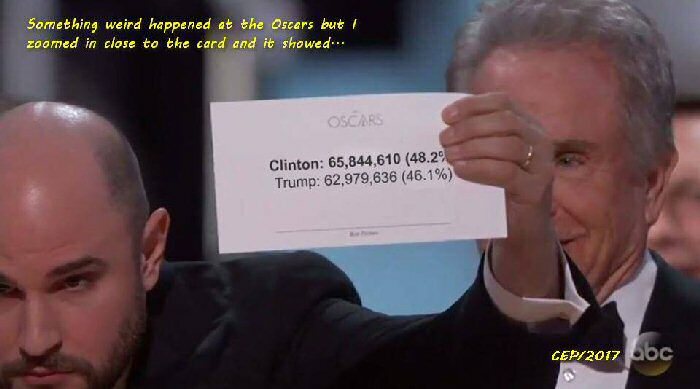 He held up the card clearly showing the winner was Clinton, not Moonlight. Warren Beatty used to be the talk of the town because of the women he had on his arm, but now it’s because of the envelope he’s got tucked under it.